Roman Nose was born in about 1830. A Cheyenne warrior, he was originally given the name Woquini. 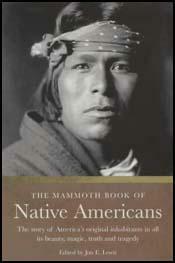 As a young man, a medicine man, White Bull, made him a special war bonnet with eagle feathers. White Bull told him that the bonnet would protect him from his enemies' arrows and bullets provided that he obeyed strict taboos and carried out certain rituals. For example, he was warned that if he ate anything touched by metal he would be killed in his next battle. Roman Nose remained at peace with the white settlers and soldiers until the Sand Creek Massacre. He now became one of the most important figures in the revenge attacks that now took place. Roman Nose was at the Battle of Platte River (July, 1865) and the attack on the Powder River Expedition (September, 1865). He was also opposed to the building of the union pacific railroad through buffalo country. Over the next few months he carried out raids on the men working on the line. In September 1868 Roman Nose inadvertently ate food touched by metal. As White Bull predicted Roman Nose was killed during his next battle at Beecher Island.